CanMEDS is a framework for improving patient care by enhancing physician training. Developed by the Royal College in the 1990s, its main purpose is to define the necessary competencies for all areas of medical practice and provide a comprehensive foundation for medical education and practice in Canada. 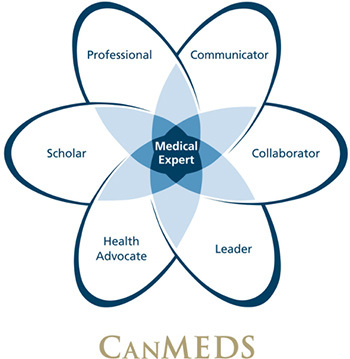 Since its formal adoption by the Royal College in 1996, CanMEDS has become the most widely accepted and applied physician competency framework in the world. It reflects the work of hundreds of Royal College Fellows and volunteers and is based on empirical research, sound education principles and broad stakeholder consultation. Renewal is key to the CanMEDS Framework’s ongoing success, which is why it has been updated twice since it was developed — in 2005 and again in 2015. Updated in 2015, the CanMEDS diagram shows the seven CanMEDS Roles and their interconnections. The CanMEDS diagram and associated materials are trademarked and can only be reproduced with permission from the Royal College. To obtain permission, please fill out the CanMEDS diagram request form and submit it to canmeds@royalcollege.ca for approval.